Dr Hugo Pin is a highly qualified French-trained physician who offers a complete range of vein and cosmetic services to restore face and body confidence. A well-known doctor on the Coast, Dr Pin firmly believes in enhancing your natural beauty using state-of-the-art procedures, quality materials and advanced technology to achieve a ‘less is more’ result. 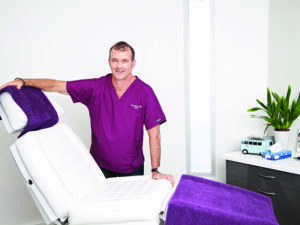 His bright, modern clinic in Cotton Tree offers a full range of services, from varicose vein injections and laser treatments to wrinkle treatments, dermal fillers and facial rejuvenation treatments suitable for any age. Uniquely, Dr Pin is also a leader in advanced cosmetic services, including the non-surgical invisible facelift, which provides immediate and natural results within 30 minutes. The ‘thread’ lift is perfect for reducing a sagging jawline and restoring plump-looking cheeks while still providing full facial movement and expression. Dr Pin is also trained and highly skilled in Double Chin Fat dissolving injections and Liposculpture to tighten your physique or assist with achieving weight loss goals. These techniques use minimally invasive cosmetic solutions to reduce and dissolve unwanted fat to restore your body confidence and create beautiful results. As a trained medical professional, Dr Pin is also able to repair overdone and overfilled results from other clinics, bringing you back to a more natural looking appearance. He is also a specialist in procedures tailored especially for men, including cosmetic injections, facial and lip improvements. Dr Pin’s success lies in his skill as a physician, based on years of training both in France, the US and Australia. His wide range of services means that cosmetic treatments can all be done in Dr Pin’s modern, tranquil and private clinic without the need to visit different physicians. His return clients and results speak for themselves. Download our FREE veins guide!